The photo above is the Boatbuilder's Bevel that has been in use in our shop for more than 30 years. It has lost its initial sheen, but still works just fine. I'd be lost without it. Made of half hard flat brass stock, this is one of the handiest tools a builder can own. If you've spent much time trying to use a standard 6" adjustable bevel in close quarters, you already know how unhandy that is. This pocket-sized bevel is just the right size for picking bevels off a plan or a lofting, working in tight spots inboard, checking plank edges, and for setting saws. We made the first one 30 years ago while working in the eyes of a 57' Trawler Yacht, and it has been in use ever since. Recommended in Mohr's Canoe Craft and Rob Steward's Boatbuilding Manual, this is far and away the most popular tool in our catalogue. Before you ask, no, we no longer make our 4 oz. 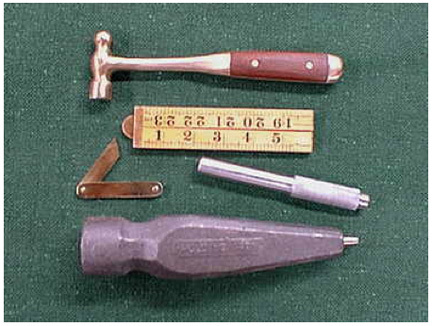 Bronze Riveting Hammers, though we do offer others. Solid and functionally straightforward. A joy of simplicity and practicality. The size of the bevel is perfect. My only issue is the finish. I found small metal burrs and sharp edges. A bit of sandpaper took care of these. Delivery was fast. This bevel is perfect for tight spaces, and a pleasure to use. The delivery was quick too.